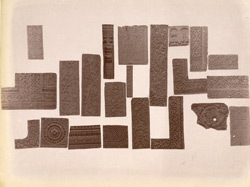 Photograph of a group of casts from buildings at Fatehpur Sikri, from the Archaeological Survey of India Collections, taken by Edmund William Smith in 1893. The palace-city complex at Fatehpur Sikri was built by the Mughal Emperor Akbar (r.1556-1605) between 1571 and 1585. Akbar built his city close to the saint Shaikh Salim Chisti's refuge, after the saint had successfully predicted the birth of the Emperor's son and heir, Prince Salim, later Emperor Jahangir. The casts in this photograph, taken from buildings in Fatehpur Sikri, show a range of carved decorative patterns. There are no specific identifications supplied for these cast fragments.